This book examines claims involving unjust enrichment and public bodies in France,England and the EU. Part 1 explores the law as it now stands in England and Wales as a result of cases such as Woolwich EBS v IRC, those resulting from the decision of the European Court of Justice (ECJ) in Metallgesellschaft and Hoechst v IRC and those involving Local Authority swaps transactions. So far these cases have been viewed from either a public or a private law perspective, whereas in fact both branches of the law are relevant, and the author argues that the courts ought not to lose sight of the public law issues when a claim is brought under the private law of unjust enrichment, or vice versa. In order to achieve this a hybrid approach is outlined which would allow the law access to both the public and private law aspects of such cases. 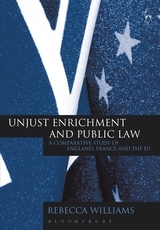 Since there has been much discussion, particularly in the context of public body cases, of the relationship between the common law and civilian approaches to unjust enrichment, or enrichment without cause, Part 2 considers the French approach in order to ascertain what lessons it holds for England and Wales. And finally, as the Metallgesellschaft case itself makes clear, no understanding of such cases can be complete without an examination of the relevant EU law. Thus Part 3 investigates the principle of unjust enrichment in the European Union and the division of labour between the European and the domestic courts in the ECJ's so-called 'remedies jurisprudence'. In particular it examines the extent to which the two relevant issues, public law and unjust enrichment, are defined in EU law, and to what extent this remains a task for the domestic courts. WHAT IS THE WOOLWICH UNJUST FACTOR? A WHOLLY PUBLIC APPROACH: COULD RESTITUTION SIMPLY BE A RESPONSE TO A PUBLIC LAW EVENT? Need There Have Been a Demand for the Public Law Reason for Restitution to Operate? Need There Have Been a Protest for the Public Law Reason for Restitution to Operate? To What Extent is the Public Law Reason for Restitution Overridden by Statute? What Exactly Does the Claimant Recover? Is it Always Necessary to Bring Two Separate Cases, One Action for Judicial Review and One Private Law Claim? Over What Subject Matter does the Public Law Reason for Restitution Extend? What Sort of Invalidity Triggers this Reason for Restitution? Which Kinds of Body Will Give Rise to this Reason for Restitution? REASONS FOR RESTITUTION AND TIME LIMITS: IS A HIERARCHY POSSIBLE? Does Mistake Provide a Broader Ground of Recovery than the Public Law Reason for Restitution? HOW WIDE ARE THE EFFECTS OF THE PUBLIC LAW REASON FOR RESTITUTION? How Wide is the Finding of Ultra Vires? How Far does a Claim in Unjust Enrichment Extend into Consequential Loss? WHAT GENERAL IMPLICATIONS DOES THE HYBRID NATURE OF THE REASON FOR RESTITUTION HAVE FOR DEFENCES? AN EU LAW OF UNJUST ENRICHMENT? IS THERE AN EU LAW 'EVENT' OF ULTRA VIRES IN CASES INVOLVING BOTH EU AND NATIONAL LAW? “Unjust Enrichment and Public Law is an important contribution to this topical subject. The discussion of English law is comprehensive and well argued, and will interest both public and private lawyers. Unjust Enrichment and Public Law is a well-written and well-presented book, which does much to advance our understanding of this difficult area of law. It deserves the attention of lawyers across the public/private divide. Rebecca Williams is Fellow and Tutor in Law at Pembroke College, Oxford University.